All ebooks can be accessed from school, from home, or from anywhere that has internet access. There are TWO ways to access the wonderful ebooks. Method 1: The ebooks can be accessed through your school's online library catalog which is called Follett Destiny Library Manager. To get to the online catalog, your school librarian has a link to the catalog on his/her library webpage. You can also get to your school's catalog through the Quicklinks on the district webpage. Method 2: The eBooks can also be accessed through an external Follett Shelf login page. The username for Follett Shelf is ebooks. These helpful tutorials will provide step-by-step instructions for accessing the ebooks and navigating through the ereader interface. The librarian in each school is also an expert on the use of the district's collection of ebooks and can answer any ebook questions that arise. You can download an app for Follett Shelf! 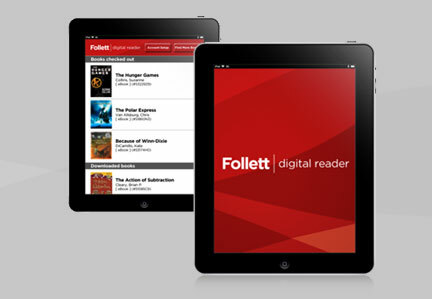 On either your Apple device (iPad, iPhone, iPod Touch) or your Android device, search for the app called Follett Digital Reader.